Andorra with its capital Andorra la Vella is located in Europe (Southwestern Europe, Pyrenees mountains). It covers some 469 square kilometers (2.5 times the size of Washington, DC) with 76,965 citizens. 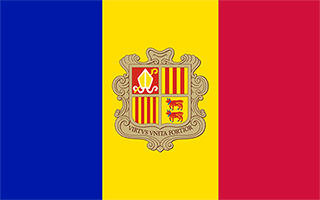 Catalan is the language commonly spoken used by the people in Andorra. Interesting info is sharing borders with France and Spain. Andorra is a small, mountainous country in the Pyrenees mountains in Europe, and is on the Iberian Peninsula, on the border between France and Spain, in Southern Europe. Andorra is arguably a city-state and has no distinct cities as such. Imagine a steep gorge in the mountains and now cram into it a whole capital city complete with roads, restaurants, souvenir shops, services, hotels and transport system, and you have Andorra La Vella. Long isolated and impoverished, Andorra achieved considerable prosperity since World War II through its tourist industry. Many immigrants (legal and illegal) are attracted to the thriving economy with its lack of income taxes. The landscape is rugged mountains dissected by narrow valleys. The average density of population is about 164 per km². The climate in Andorra can be described as temperate with snowy, cold winters and warm, dry summers. Potential threats by nature are avalanches. To reach someone Andorra dial +376 prior to a number. The local cellular networks are operated on 900 MHz, 1800 MHz, 3G, 4G. Websites typically end with the top level domain ".ad". If you want to bring electric appliances (e.g. battery chaarger), keep in min the local 230 V - 50 Hz (plugs: C, F). The sign for the locally used currency Euro is EUR. Three vertical bands of blue (hoist side), yellow, and red, with the national coat of arms centered in the yellow band; the latter band is slightly wider than the other 2 so that the ratio of band widths is 8:9:8; the coat of arms features a quartered shield with the emblems of (starting in the upper left and proceeding clockwise): Urgell, Foix, Bearn, and Catalonia; the motto reads VIRTUS UNITA FORTIOR (Strength United is Stronger); the flag combines the blue and red French colors with the red and yellow of Spain to show Franco-Spanish protection. The landlocked Principality of Andorra is one of the smallest states in Europe, nestled high in the Pyrenees between the French and Spanish borders. For 715 years, from 1278 to 1993, Andorrans lived under a unique coprincipality, ruled by French and Spanish leaders (from 1607 onward, the French chief of state and the Bishop of Urgell). In 1993, this feudal system was modified with the introduction of a modern, constitution; the co-princes remained as titular heads of state, but the government transformed into a parliamentary democracy. Andorra has become a popular tourist destination visited by approximately 8 million people each year drawn by the winter sports, summer climate, and duty-free shopping. Andorra has also become a wealthy international commercial center because of its mature banking sector and low taxes. As part of its effort to modernize its economy, Andorra has opened to foreign investment, and engaged in other reforms, such as advancing tax initiatives aimed at supporting a broader infrastructure. Although not a member of the EU, Andorra enjoys a special relationship with the organization and uses the euro as its national currency.